Cottage on the Edge - the DIY Cottage Blog: Installing Vinyl Siding: Hang it don't Nail it! Installing Vinyl Siding: Hang it don't Nail it! Vinyl expands and contracts with changes in temperature, so how the vinyl is secured to the house is important. It can't be secured firmly—it has to be able to move. So you don't really attach the vinyl to the house—essentially, you hang it. You generally need galvanized roofing nails, at least 1-¼" long (or long enough to penetrate ¾" into solid wood studs. 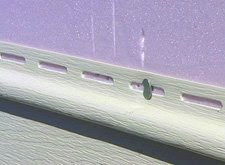 All vinyl siding and accessories come with slots to nail through. When you nail, you don't drive the nail tight. Some manuals specify that there should be a 1/32" between the head of the nail and the siding, but there's no need to check each nail with a micrometer. If, after you've nailed it, the piece of vinyl will slide back and forth, then you're OK. If not, you've pinned it too tight to the house.